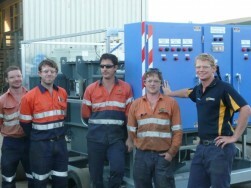 Hahn Electrical Contracting operates two workshop facilities in Kalgoorlie/Boulder and Perth. Both workshops are fully equipped with the latest repair and testing equipment to accommodate all types of electrical work, from Switchboard Manufacturing and Cable Repairs to HV Testing (at 11kv) and Low Voltage Testing (at 415v and 1000v). We also supply a large range of products and provide a convenient equipment hire service with long and short-term rentals available. Products include Cables, Switchboards, Substations, Variable Speed Drives, High Voltage Switchgear & Transformers. Click here to view our products. Our Head Office and Goldfields Workshop are both located at our Kalgoorlie/Boulder facility, which is located at 12 Clements Way, Boulder.